The musical Hamilton has taken Broadway - and the world - by storm. Led by the impressive Lin-Manuel Miranda, this show has inspired art, song, and activism, encouraging people of all ages and backgrounds to learn from America's past and stand together to make a better tomorrow. Hamilton: An American Musical was created by Lin-Manuel Miranda, who wrote the show's book, music, and lyrics and also starred in the title role. The show, which is based on the real life of founding father Alexander Hamilton, blends hip-hop with traditional musical theatre storytelling. It was nominated for a record-setting 16 Tony Awards with 11 wins. It was inspired Ron Chernow's acclaimed biography of Alexander Hamilton. 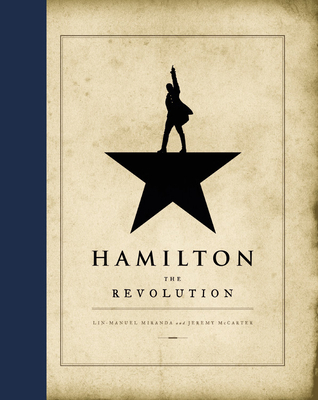 Written by Lin-Manuel Miranda and Jeremy McCarter, the Hamiltome belongs in both the history section and the musical theatre section of the library. It contains a full libretto of the show, with lyrics for every single song in the production, accompanied by full-color photographs from the show. The musical is mostly sung-through, with very little dialogue that isn't accompanied by music, so this book truly contains the complete libretto. You want behind-the-scenes pictures? Hamiltome has 'em. Dig the real stuff, quotes from historical documents and Hamilton's personal letters? That's there, too. One of my favorite things about this book is its thoughtful and candid insight into the creative process, with interviews and input from Lin-Manuel Miranda, director Thomas Kail, music director Alex Lacamoire, choreographer Andy Blankenbuehler, producers, and more. I also love that it names and compliments every single member of the cast, shining the spotlight on individuals in pages surrounding their character's solos or standout moments, celebrating the talents and importance of the ensemble. This show is impressive not only in what it accomplishes on stage, but also offstage: It has encouraged people to discuss America's past, present, and future. It also helped lots of high school students with their AP History tests. It has broken the traditional casting mold and given performers opportunities to play characters they might not otherwise. It has given new voice to an old story. It's been said time and time again: Hamilton the musical is America then as told by America now. As someone who has followed Lin's career for a decade and thus soaked up every bit of Hamilton since that fateful White House presentation, I am very happy that the show has had such an impact - and as a bookworm since birth, I am very happy that this show has such an awesome book to put in the hands of history buffs and musical theatre aficionados alike. Three cheers for the Hamiltome. Watch Lin-Manuel Miranda's performance at the White House Poetry Jam in 2009, accompanied by Alex Lacamoire. This review was cross-posted at GuysLitWire.